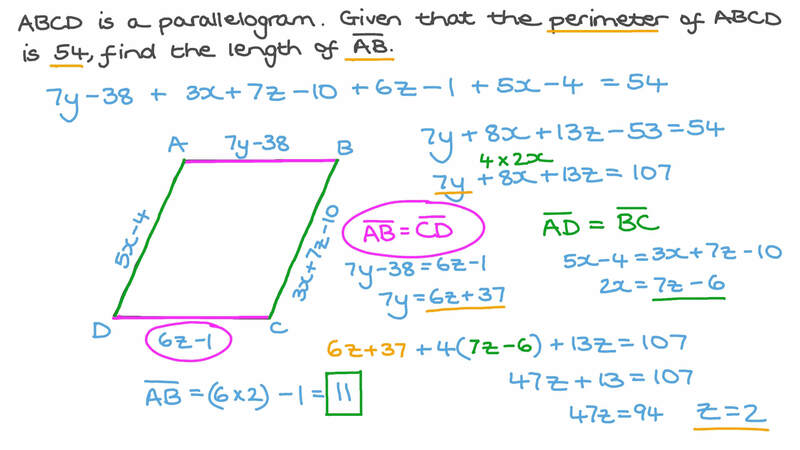 In this lesson, we will learn how to find the perimeter of a parallelogram and how to construct an algebraic expression that indicates this perimeter. Given that 𝐴 𝐵 𝐶 𝐷 is a parallelogram, find 𝑚 ∠ 𝐷 , 𝑚 ∠ 𝐴 , and the perimeter of 𝐴 𝐵 𝐶 𝐷 . In the figure below, both 𝐴 𝐵 𝐶 𝐷 and 𝐻 𝐵 𝐶 𝑂 are parallelograms, and the perimeter of 𝐴 𝐵 𝐶 𝐷 is 55.4 cm. Find the length of 𝑂 𝐻 . Given a rectangle with sides 8 and 3, and a parallelogram with sides 2 and 5, what is the difference in their perimeters? The lengths of two adjacent sides of a parallelogram are 8 𝑡 units and 8 𝑐 units. Write an expression for its perimeter. 𝐴 𝐵 𝐶 𝐷 is a parallelogram. Given that the perimeter of 𝐴 𝐵 𝐶 𝐷 is 54, find the length of 𝐴 𝐵 . Calculate the perimeter of a parallelogram having side lengths of 39 cm and 5 cm. One side of a parallelogram is 2, and its perimeter is 70. Determine the length of the other side. Given that 𝐴 𝐵 𝐶 𝐷 is a parallelogram, and the perimeter of △ 𝐵 𝐸 𝐶 is 178 cm, determine the length of 𝐸 𝐶 .
𝐴 𝐵 𝐶 𝐷 is a parallelogram. Given that the perimeter of 𝐴 𝐵 𝐶 𝐷 is 88, find the length of 𝐴 𝐵 .
𝐴 𝐵 𝐶 𝐷 is a parallelogram. Given that the perimeter of 𝐴 𝐵 𝐶 𝐷 is 170, find the length of 𝐴 𝐵 .
𝐴 𝐵 𝐶 𝐷 is a parallelogram. Given that the perimeter of 𝐴 𝐵 𝐶 𝐷 is 128, find the length of 𝐴 𝐵 . Given a rectangle with sides 5 and 8, and a parallelogram with sides 7 and 5, what is the difference in their perimeters? In the figure below, both 𝐴 𝐵 𝐶 𝐷 and 𝐻 𝐵 𝐶 𝑂 are parallelograms, and the perimeter of 𝐴 𝐵 𝐶 𝐷 is 26.2 cm. Find the length of 𝑂 𝐻 . Calculate the perimeter of a parallelogram having side lengths of 10 cm and 6 cm. Calculate the perimeter of a parallelogram having side lengths of 47 cm and 31 cm. The lengths of two adjacent sides of a parallelogram are 9 𝑏 units and 9 𝑦 units. Write an expression for its perimeter.